If you prefer something other than plastic bins for storage purposes, look to baskets. They can hold everything from art supplies to blankets to paper goods. But they’re not just functional – baskets add an element of natural beauty to a space and complement the décor, too. They can be useful in every room, from the attic to the basement. In the kitchen, various sizes can be used as decorative elements on top of cabinets; smaller baskets can hold potted herbs. In the bathroom, they make the perfect holder for towels and toiletries or as a trashcan. In the living room, matching baskets can be placed on shelves to store remote controls and magazines. In a home office, they can be the go-to place for papers and desk supplies replacing a sterile metal file cabinet. In a kid’s room or playroom, baskets can be put on low shelves, designating one for cars, another for coloring books and crayons, etc., which makes it easy for even young children to help clean up. Shallow baskets also come in handy when you’re having a barbecue – they make a convenient place to store eating utensils and napkins. 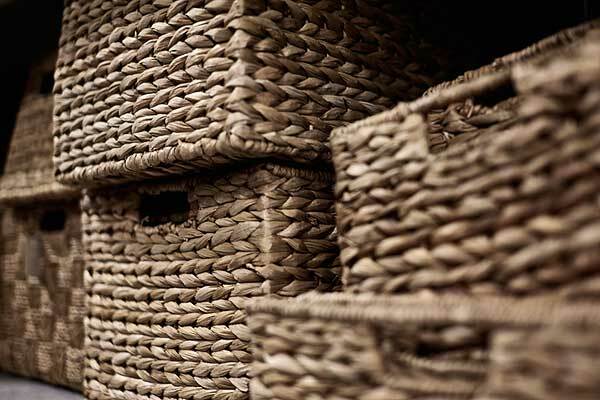 Baskets come in a big variety of materials, including rattan, wicker, sisal and seagrass.